The pain and suffering that a flawed medical device can cause can last a long time. A Dallas jury provided a timely reminder of that, deciding six California plaintiffs should be paid more than $1 billion for the harm they suffered because of metal-on-metal hip replacement hardware made by Johnson & Johnson’s DePuy Orthopedics unit. The Californians proved to jurors that they suffered tissue death, bone erosion, and other at times excruciating injury due to the faulty Pinnacle hip replacement product, which they said had been promoted as longer lasting and less risky than other alternatives. Jurors also heard that DePuy knew the products were defective and failed to warn patients. Johnson & Johnson said it had acted appropriately and believed the verdict, which came in one of more than 8,000 Pinnacle-related lawsuits in Texas alone, would be overturned on appeal due to what the company said were errors by the presiding judge. The Texas case, with a verdict reported as one of the largest in 2016, was not covered as part of a $2.5 billion settlement DePuy reached over its artificial hips in New Jersey. Johnson and Johnson recalled 93,000 of its hip products in 2010, and the federal Food and Drug Administration has sought to get out front of growing problems with metal-on-metal hip replacements (see agency illustration above) with heightened scrutiny and public information. 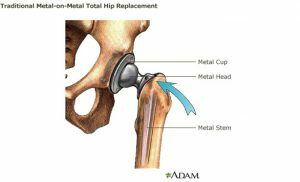 Patients in the Texas case argued that one of the huge flaws with the metal hip parts is their tendency to decay, leaching toxic chromium and cobalt into the blood. The winning attorney in the latest DePuy case said the sizable verdict should send a message to the device maker to settle pending suits. This decision came down just as Congress is considering a $6.3 billion health care funding bill, which has critics furious because it includes proposals they say will needlessly ease regulatory approvals for drugs and medical devices and endanger patient safety. Proponents say these steps will cut needless red tape that slows beneficial treatments from helping patients in need. I’ve seen implant cases in my practice, and though surgeons over time have made hip replacement a significantly more frequent and easier to handle procedure for patients, the operation is costly and significant still. When the procedures or medical products in them fail, the misery patients experience can be considerable. Jurors and courts have already sent this maker billions of signals that the Pinnacle ordeal shouldn’t be worsened and prolonged by a corporate reluctance to fess up and take responsibility to help the harmed.